European stocks are set to slump on the open as geopolitical tensions ratchet up once again. Ukraine's escalating conflict overshadowed yesterday's better-than-expected US jobless claims figures which would normally have acted as good support for equities. The geopolitical fear also outmuscled corporate earnings and ultimately sent the Dow Jones 66 points lower to 16,378. Overnight reports that President Obama has authorised military strikes against ISIS in Iraq has added to the woes, with Asian markets plunging and Dow futures already more than 70 points lower. The rising tensions in Ukraine and Russia were already looking explosive, but the appearance of another flash point and the possibility of being drawn into something deeper in Iraq is set to drag sentiment even further into the mud. 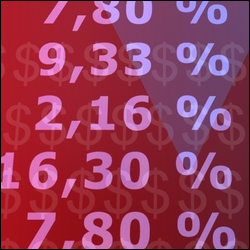 With geopolitical tensions surrounding Russia and the Ukraine continuing to look dangerous, European CFD markets are set to open on a dour note this morning. However, the sell off looks to be on pause for a moment, with the Dow Jones actually gaining 10 points to 16,445 last night, as attention shifts to the central bank meetings. The BoE is expected to maintain its record low rates but all the speculation is on whether someone from the MPC will finally break ranks and vote for a rate hike. The ECB is also likely to hold fire whilst it assesses the impact of June's rate cut, negative overnight deposits rate and the rolling out of another loan program. The press conference is where all the action happens though. Recent economic data has shown that Germany, the main country propping up the Eurozone, has started to wobble and that the rest of the members continue to perform poorly. Given this background, will Draghi will be able to say anything that inspires confidence in the Eurozone economy? We are expecting stock markets to see sharp declines on the open following overnight falls in the US and Asia. European shares may have managed to claw back some of their recent losses yesterday but it looks as though this dead cat bounce has reached its apex. After the European close, reports of a Russian military build up on the Ukrainian border spooked global markets, with the Dow Jones plunging 120 points to 16,436. Also adding to the sour mood were comments from Putin himself that Russia should retaliate against the sanctions imposed on them by the EU and the US. The conclusion that markets are drawing is that we may be about to see a huge escalation in the Ukrainian crisis. The usual excuse of 'normal military exercises' won't wash this time, so expect markets to be highly on edge whilst the West tries to decipher Putin's true intentions. European indices are set to perk up on the open, dragged higher by gains in the US. The rise in US stocks, with the Dow adding 58 points to 16,552, came on the back of another better-than-expected set of results for corporate earnings. In particular, Berkshire Hathaway led the pack but reassurances from Europe that Portugal's banking system will not get deeper into trouble also added to the rally. However, today's positive start belies the true sentiment because the consensus seems to be all over the place at the moment. For example, Europe closed yesterday's session fairly mixed, but the US was solidly higher and yet Asia is now trading lower this morning. Nothing has materially changed since last week and everything that was weighing the bulls down is still firmly wrapped around their necks. Whilst the down move may have stalled, and some markets have had a modest up tick, many traders are already framing this as a textbook 'dead cat bounce'. European equities are set to edge slightly higher on the open this morning. Geopolitical uncertainty is still fairly high but a small amount of relief has crept into sentiment as Friday's less than impressive US jobs data eases the chances on an imminent rate hike from the Fed. However, despite the bounce, the major indices remain firmly entrenched in a down move and there doesn't appear to be any clear sign of a bottom being put in any time soon. The US added 209,000 jobs last month, which was less than initially expected and kept investors nervous that the world's largest economy might begin to stutter. That extended the losses for the Dow Jones to 16,482, a 95 point slump for the day led by the likes of Goldman Sachs and JP Morgan.